Heeeeey alll! its such a gorgeous morning! its two days in a row I have been happily pinteresting my morning in Starbucks! with a large cup of coffee a buttery croissant and pinterest! My mornings cannot get better than this! 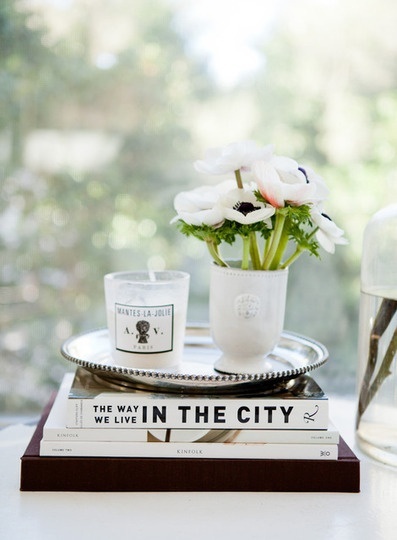 silver tray+ white scented candles+white vase with flowers+ black and white book accents= Gorgeous morning vignette! Well the only thing that could make this morning even better is a vignette created with a sharp silver tray with a white scented candles over it and a white vase with flowers and black and white books as accents! Won,t it just sparkle your morning! haha nothing better than a croissant & starbucks coffee in the morning! Sweet.